Bloat-Hog is a member of the Hog species, and the ruler of the Melon Kingdom. He is one of the four Hog bosses that Donkey Kong must fight in Donkey Kong Jungle Beat. Like any Hog, Bloat-Hog appears as a bipedal pig-like creature with four horns, hooves for hands, and a Mohawk. His Mohawk is colored black, and his skin color is red, with black hooves and horns and yellow eyes. Bloat-Hog's attacks include throwing fruits and electrified melons at Donkey Kong and if the ape gets too close, Bloat-Hog will do slash attacks or even an electrified dash. Donkey Kong must un-electrify the melons by using the Sound Wave Attack and then punch or kick them back to Bloat-Hog. 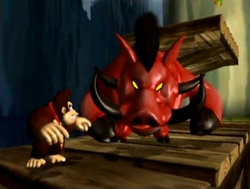 Once Bloat-Hog is stunned, Donkey Kong will get the chance to pummel him. After taking some damage, Bloat-Hog will mentally charge up eight electric spheres to fire them in all directions. This page was last edited on April 12, 2019, at 13:18.